This Circus Animal Cookie Cake is layers of vanilla cake, vanilla frosting and Circus Animal Cookies with a pink chocolate ganache. You know what is the BEST thing ever? Sleeping in on a weekend morning. Really Sundays are the days I enjoy it the most, because I am cherishing every minute of the morning before I have to get up. Even though I had a million things to do this weekend, I tried to sleep just a few extra minutes yesterday. Then I got busy shooting this cake, because I couldn’t wait to slice into it any longer! You know what is NOT the best thing ever? Sunday nights. Even though a few of my favorite shows are on TV, I am just not into the whole going back to work on Monday morning deal. Plus Sunday night means I am running around trying to get everything lined up for the week. I have to meal prep, which is also not my favorite thing. So this cake. You guys, I can’t even. CIRCUS ANIMAL COOKIE CAKE!! Who doesn’t love Circus Animal Cookies? 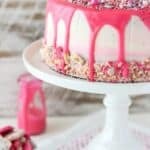 Pink and white chocolate, cookies and sprinkles? What’s not to love? This cake has been on my mind for such a long time, but it’s been so hot I can’t really justify turning on the oven in my air condition-less house. Finally I cracked, I couldn’t wait any longer! 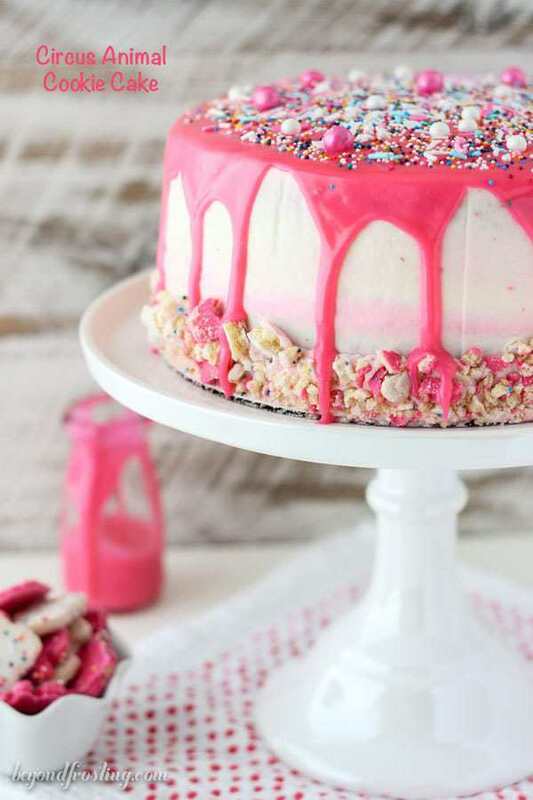 To make this Circus Animal Cookie Cake, you’ll need two layers of vanilla cake, which are marbled with white and pink cake. Also there is an ombre vanilla frosting with a layer of Circus Animal Cookies and pink chocolate ganache. There are several steps to making this cake, but it is really quite easy. I decided to use a box mix because it was quicker, but feel free to use your favorite white cake mix here. However, if you’d like a homemade version, try my moist vanilla cake instead. 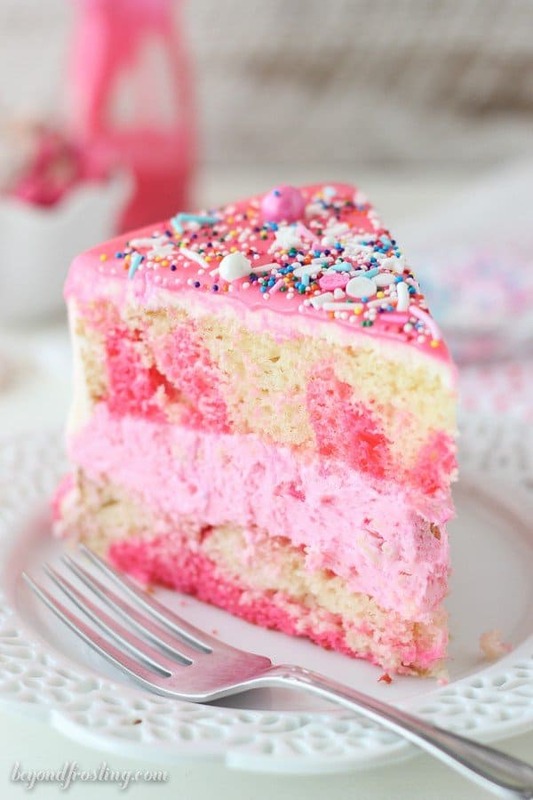 When you make the cake batter, separate out some of the batter and mix in some pink food coloring. I like to use “gel” colors, which are thicker than traditional food coloring. I have the Wilton ColorRight system, but you can also buy individual dye colors at stores like Michael’s or JoAnns fabric. Sometimes Walmart has them too. You really only need a couple of tiny drops of the gel. Start small because you can always make it darker, but you can’t make it light! You can layer the batter in the pan, a little bit of white batter and a little bit of pink and then swirl them together with a knife. 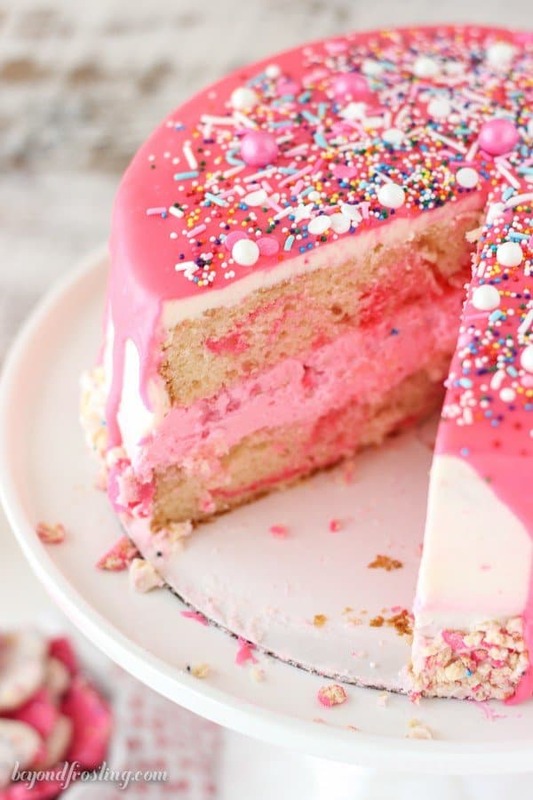 The pink tends to dominate the cake, so you really don’t need that much of it. In between those layers of cake is a pink frosting and crushed Circus Animal Cookies. You’ll also find some crushed cookies around the outside edges of the cake. The last time I bought a bag of these cookies, my boyfriend ate all the leftover cookies. He is such a sneak! Perhaps my favorite part of this cake is the drippy ganache. I’ve always admired the crazy cakes from Katherine Sabbath, and a colored ganache has been on my to-do list. I used the same pink gel coloring for the ganache that I used for the cake. At first I thought I needed to use candy melts, but I did a little Goggling and learned I could dye some white chocolate ganache and that seemed to be the easiest because it doesn’t get too hard. The most important part of the ganache is that it is thin enough to nicely drip down the side of the cake. I started with 3 tablespoons of heavy whipping cream and microwaved the chocolate, then I added the additional heavy cream after stirring the ganache. Whatever you do, make sure it’s nice and smooth! If making a cake intimidates you, I’ve shared some tips I picked up along the way. I used similar techniques for my Valentine’s Day Cake and my Chocolate Stout Cake, but I’ll share them with you again today. To add the frosting between the layers, I use a piping bag fitting with a large open round tip, or I just snap off the end, about 1/2″ up. I work from the outside in, and then use an angled spatula to smooth it out and fill in the gaps. You can use a large Ziploc bag if you need to. Add a crumb coat to the outside and then refrigerate until it is slightly firm. This will help you when you add the final layering of frosting on top. Just don’t mix the crumb coat frosting back into the bowl. Sometimes it has cake crumbs in it. Hence the term, crumb coat. I use Viva paper towels and a fondant smoother to get those nice smooth edges. I first heard this tip in my cake decorating classes, but then I watched this tutorial from Lindsay about how to frost a smooth cake it was life changing! If nothing else, can we just agree this cake is so much FUN! If you like Circus Animal Cookies, you will love this cake! It’s an easy vanilla tye dye cake, vanilla buttercream and Circus Animal cookies. 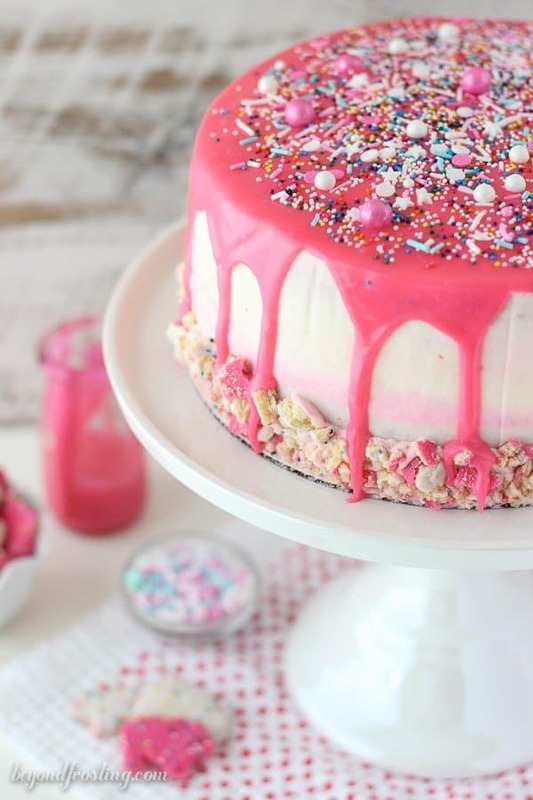 It’s covered in a pink chocolate ganache and sprinkles. For the cake: Preheat the oven to 350°F. Grease and flour two 8-inch cake pans. In a large mixing bowl, combine the cake mix, eggs, oil, milk, sour cream and vanilla and almond extract. Mix at a medium speed until well combined. Spoon out a little less than half (about 1/3) of the cake batter and slowly add the food color until you reach the desired pink color. Start small because you can always go darker but you can’t go lighter! 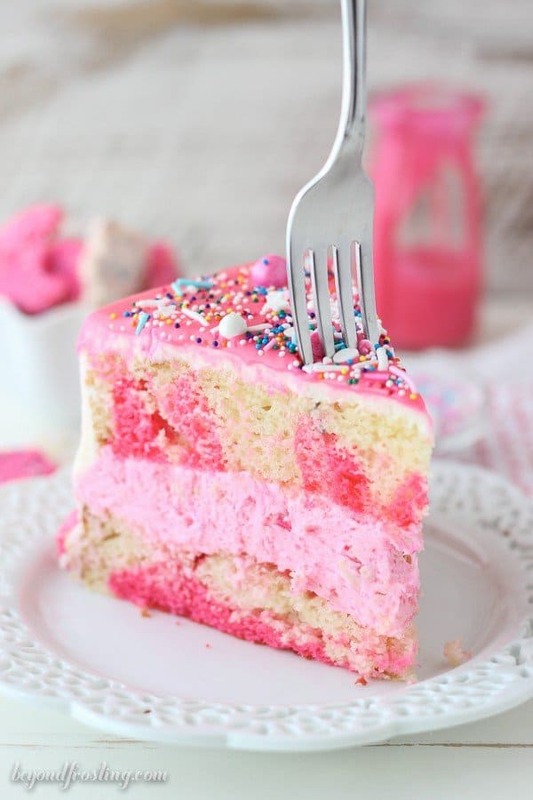 Layer the cake batter by alternating the vanilla cake batter with the pink cake batter and swirl with a knife. Continue until you run out of cake batter. Bake at 350°F for 28-35 minutes. If your cake is still a bit jiggling, cook for 2 minutes at a time until it doesn’t jiggle anymore. Test the cake by inserting a toothpick into the center of the cake, if the toothpick comes out clean, your cake is done. Allow the cake to cool completely. For the frosting: Allow the butter to soften on the counter for 30 minutes. Beat the butter at a high speed until it is lighter in color, scraping down the bowl as needed. Slowly add the powdered sugar 2 to 3 cups at a time, reduce the mixing speed and beating the sugar into the butter until it’s mixed. As the frosting starts to thicken, alternate in the heavy cream and the vanilla and almond extract with the powdered sugar. Once all the powdered sugar has been added, continue beating at a high speed for 1 to 2 minutes to beat extra air into the frosting. Separate out about 2 to 2 ½ cups of frosting into a separate bowl. Drop in the pink food coloring 2 small drops first, mix and repeat until you reach your desired color. Food gels are thicker than food coloring, so it doesn’t take as much! 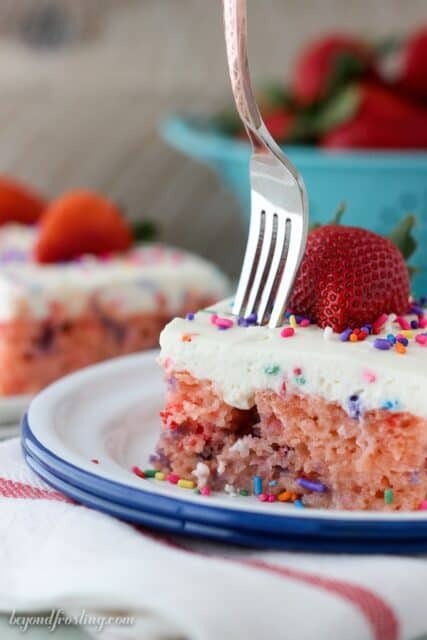 Using a spatula, put all the pink frosting is a large piping bag or large Ziploc bag. Cut the tip of the bag off, about ½-inch up. To assemble the cake: Torte the top of cake, creating a flat surface. Add a dollop of frosting on the bottom of the cake plate and place the bottom layer of cake on top. The frosting will help prevent the cake from sliding. Fill the first layer of frosting by using your piping bag and pipe from the outside edge into the center. Gently spread the frosting with an offset spatula to fill in the gaps. You should have some leftover frosting after you pipe this layer. Take 1 ½ cups of circus animal cookies and crush them using a Ziploc bag and a rolling pin. The pieces should be smaller than a dime. Sprinkle 2/3 of the crushed cookies over the layer of pink frosting. Take some remaining pink frosting and pipe it on top of the cookies, and then spread it out a bit. 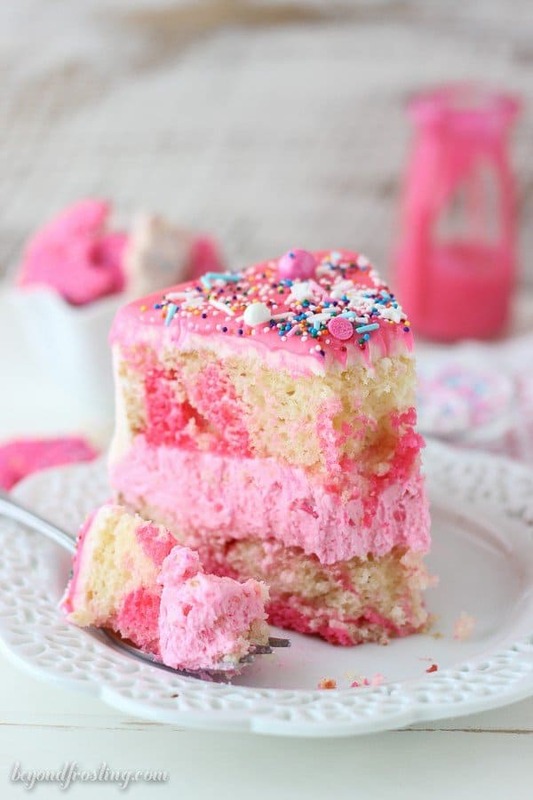 You should still have just a little bit of pink frosting left, which you will use for the outside of the cake. Place the second layer on top. Normally I invert the second layer so the bottom of the cake is on top, so it is nice and even. 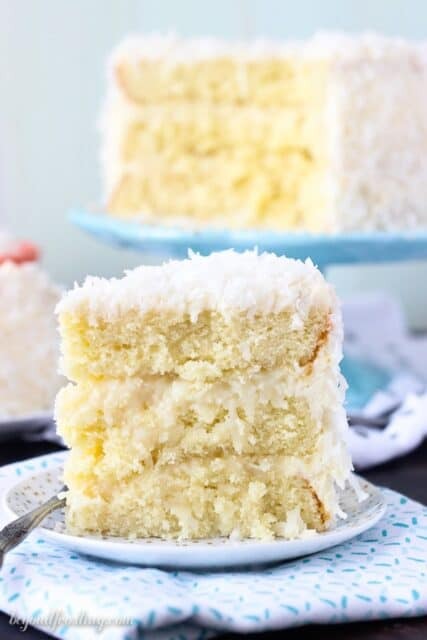 Use some of your white frosting to create a crumb coat layer, a thin layer of frosting on the outside of the cake. It doesn’t need to be clean or nice and even, that’s why it’s a crumb coat. Refrigerate the cake for at least 15 minute to allow the crumb coat to harden. Remove the cake from the refrigerator. First, add about ½ cup of frosting to the top of the cake and create a nice, smooth top. Use your Viva paper towel and fondant smoother to create a flat even surface. Spread the remaining frosting on the outside edge of the cake working from the bottom to the top. I also added in a few dots of the pink frosting to create the ombre look. Use your icing smoother or large offset spatula to smooth edges and remove excess frosting. Again, use your Viva paper towels and the icing smoother to help smooth out the edges of the cake. You may need a little excess frosting along the bottom edge to stick the cookies into. Take the remaining crushed cookies and use your hands to press them into bottom edge of the cake. For the ganache: In a microwave-safe bowl, combined the white chocolate chips with 3 tablespoons of heavy whipping cream. Microwave at 50% power for 1 minutes. Remove from the microwave and stir until smooth. If the chocolate is not melted, return it the microwave for another 30 seconds, at 50% power. Add an additional 1 to 2 tablespoons of heavy whipping cream until the ganache is runny enough to drop down the sides of the cake. Add a couple small drops of pink food gel and whisk until smooth and until the ganache reaches your desired color. To drizzle the ganache, use a piping bag and squeeze the ganache near the edges of the cake and if needed, use the flat edge of your offset spatula and push it gently over the sides. Repeat these steps until you are satisfied with the dripped edges. Pour the remaining ganache in the middle of your cake and gently flood out to the edges with the offset spatula. Add sprinkles to the top of the cake as desired. Allow the ganache to set until slightly firmed. Just made this and it is beautiful! Your directions were easy to follow. I can’t wait to show it off. Thank you so much Kendra! I hope you enjoy! First, the cake is beautiful! Second, the additional ingredients to box cake mix is genius. Third, I turned this recipe into cupcakes and won first place at our annual crawfish boil. If I could post my picture of this winning cupcake for you to see, I would…Thank you for the inspiration and the fantastic recipe! Thanks for the recipe and directions! I made a purple version, very happy with it! That is so fun Jennifer! I would love to see it! Just made this cake, and it does turn out to be a beautiful looking cake. If you like buttercream frosting, this is a hit. If you want to adjust the frosting, i would do one with cream cheese and use less sugar. The frosting was too sweet for me. Loved the cake batter with almond extract, added an extra touch. Hi Anna, I am glad you liked the cake. There is definitely quite a bit of frosting here, but I love your suggestion of the cream cheese frosting! What a fun cake! So creative! This cake is just ADORABLE!! And it looks so tasty! I love the cookie crumbs and ganache!! STUHHHHNING cake. Seriously gorgeous. And the pink shade is so right. This cake just makes you happy looking at it. And the crushed cookies on the side, yum!